To be more “productive”, I recently upgraded my work space. 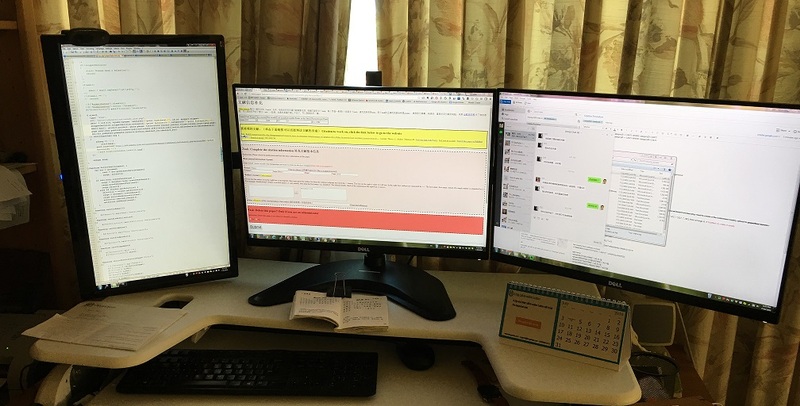 I used to have 2 monitors side by side. Both of them are View Sonic but they are of different size and one is old. So I purchased two monitors (Dell U2415). Together with one original View Sonic monitor, now I get 3 monitors on my desk. The left one is the original view sonic one with resolution 1920 x 1080. I make it vertical because I write a lot of codes and a vertical placement allows me see more lines of codes at the same time. So this monitor is almost dedicated to writing codes. The right two are Dell U2415 with resolution 1920 x 1200. According to some people, “Dell UltraSharp series is a gold standard in excellence which programmers have used and loved for years”. I myself do love it a lot. These monitors have a very thin bezel, which is ideal for side-by-side placement. I use the middle screen for the current job (Excel, browsing etc), and the right screen for supportive function (e.g. wechat, FileZilla, QQ, windows explorer etc). Of course, to make the 3 monitor setup possible, I need a trip-monitor stand. The one I use is SIIG 13″-27″ Articulated Freestanding Triple Monitor Desk Stand. It does an OK job. One of the reason I chose it because it does not need a grommet. I am using varidesk and there is not much space under the table.